Near the Basque Corniche, beautiful villa of 215m2 is located upstream of a hill. Contemporary in style, it is located in an exceptional setting. Due to its prime location, it enjoys breathtaking views of the sea and mountains. 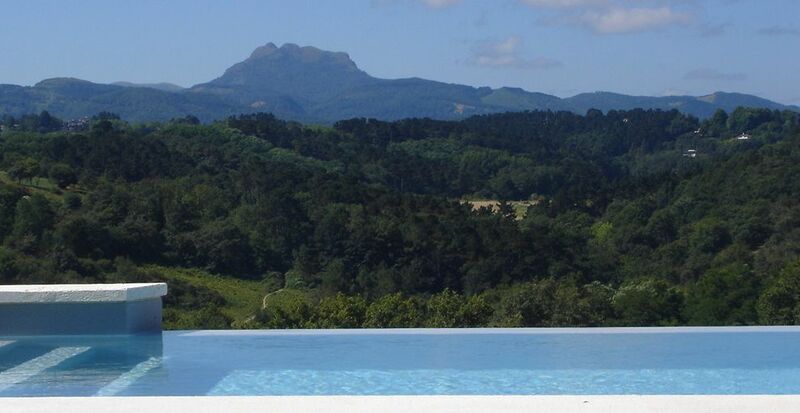 It consists of 6 rooms, a seeming infinity pool spread in the valley and enjoys a sunny climate. The whole villa is lined with exotic natural stone and wooden terraces and various relaxation and conviviality. Frame '' Lovely, relaxing, perfect. '', Which is for all those who dream of reconciling in a highly touristic part, homecoming and modern comfort. Bookings are normally for a minimum of 7 days, from Saturday to Saturday but do not hesitate to contact me for any other period. We are a thirty-year old couple, from the Basque Country, working for an International Organisation. With this villa, all your dreams come true! Land of our childhood and adolescence, we had to move out for employment-related reasons. Today, no matter the continent we live on, this beautiful region is deeply-rooted in our minds and we hope to share this love with our children. The very first time, we have been subjugated by the natural unique and breathtaking views surrounding the villa - and we still are. The colours change every day; it's a real living painting and a feast for your eyes! Fully equipped for small children (baby travel bed, high chair, changing table, plastic dishes). Welcome gift!